L&M Mining Ltd management, Jock Braithwaite (general manager), Al Coleman (geologist & operations manager) and Jack Ryan (director) started forming plans to mine the stretch of river at the outlet of the Kawarau Gorge, upstream of Cromwell in Central Otago, in 1985/86. The Shotover No1 plant was at that time working steadily in the Maori Beach section of the Shotover, while the newly-constructed Shotover No2 plant had been commissioned and was working the stretch of river above Jaws Rapid, and below the Mother Rapid, in the Moonlight area. Originally, the Kawarau River mining rights had been held by a group of older mining industry folk, under the name a Shotover Kawarau Consolidated (SKC), headed by Walter Dunstan. He had approached the Ryan brothers, of Ryan Mining Ltd (RML), in the early 1970’s, who then commenced alluvial mining in the Shotover River using a self-designed land-based plant. The SKC agreement struck with RML transferred the mining rights to RML on payment of a royalty. L&M Mining Ltd was formed in 1969. Jock Braithwaite and Al Coleman later approached the Ryan brothers (Barney and Jack Ryan) around the late 1970’s to purchase RML and then finance the mining of the Shotover and (possibly later) Kawarau Rivers, using larger floating plants fed by twin-engine, hydraulic excavators. RML’s land-based operation was restricted in the areas of the river it could operate in and the excavator-fed, floating plants enabled almost all sections of the river to be mined. Jack Ryan stayed on as director after the death of fellow director Barney Ryan in 1985. Jack and son Mick Ryan travelled to Japan and negotiated the purchase of a 165t UH801 hydraulic excavator from Hitachi Machinery Co. 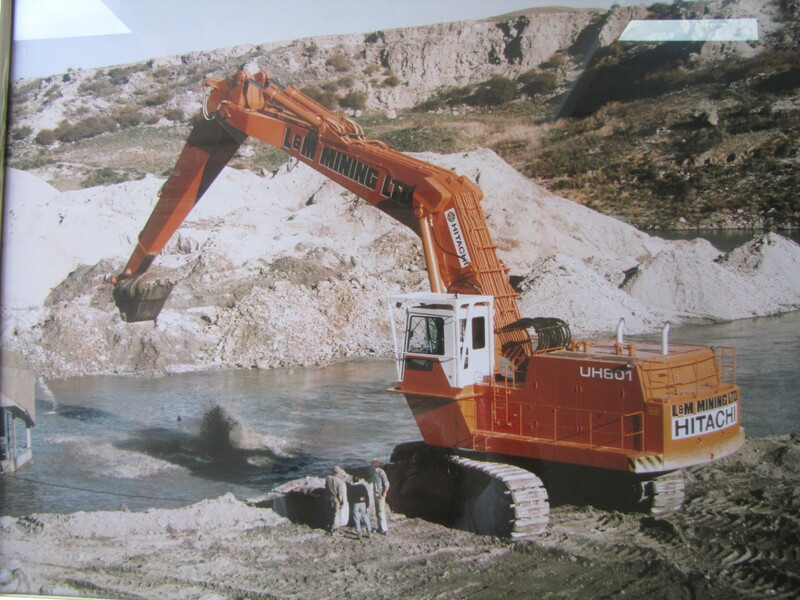 This machine was the first of the large group of excavators (+100t size) to come to New Zealand and opened the doors for the larger 180t, 250t, 350t and larger machines that the mining industry has imported into New Zealand since. While the excavator was being built and freighted to New Zealand, Al and Jock initiated the construction of the new K3 plant (Kawarau #3). Gavin Spencer, the plant foreman, Greg Caughey (engineer) and the Cochrane brothers ( Peter and James), two locals who later stayed on and crewed the plant later, assembled it alongside the Kawarau River. Once it was assembled and the UH 801 had arrived and was assembled by Cable Price , a pond was excavated, the plant pulled into the mine-pond, was commissioned and mining of the river bed commenced. The UH801 was ordered with a special long boom and long dipper arm to give it a lateral reach of approximately 100’/30m and the ability to safely excavate the Kawarau River bed to a depth of approximately 10-15m. The long configuration dictated design changes from standard UH801 components, in that the bucket was only rated at 1.6bcm (instead of the standard 5.0-8.5m3) and was operated by one bucket ram on the dipper arm instead of the standard, twin-ram configuration. The main body and track-frame of the UH801 were standard items using two Cummins engines and 10 hydraulic pumps, five per engine. K3 utilised the (by then) standard L&M Mining design practices of a 2m trommel screen with 10mm mesh, elevating stacker, 5 Pan Am 42” primary jigs and 1 Pan Am 42” secondary jig, with 2x Knudsen Bowl centrifugal recovery units for final on-board concentration. This concentration was taken off the plant daily, processed and the gold cleaned and smelted into gold bars at a Company laboratory under controlled circumstances. Water pumps on board the K3 plant provided trommel wash water, jig hutch water and deck wash requirements. Warman sand pumps moved the screened material through the recovery circuits, with -10mm tailings reporting to the river, via twin tail-chutes, while the screen oversize reported to the stacker conveyer for stacking behind the plant. Plant total operating weight was ~150t using 7 pontoons, pinned together to form an approximate pontoon dimension of 20m x 7m x 1.5m deep. The plant could be broken down into its various components for transporting purposes. Power was provided by a rear-mounted Fiat 150kva generator set, rather than the Caterpillar units used on the Shotover plants. The only hydraulics used were electric-over-hydraulic winches to move the plant within its mine pond, while a front, centrally mounted, flood winch was used for additional operating safety, in the flowing river regime, and for flood mooring when the river levels were high. 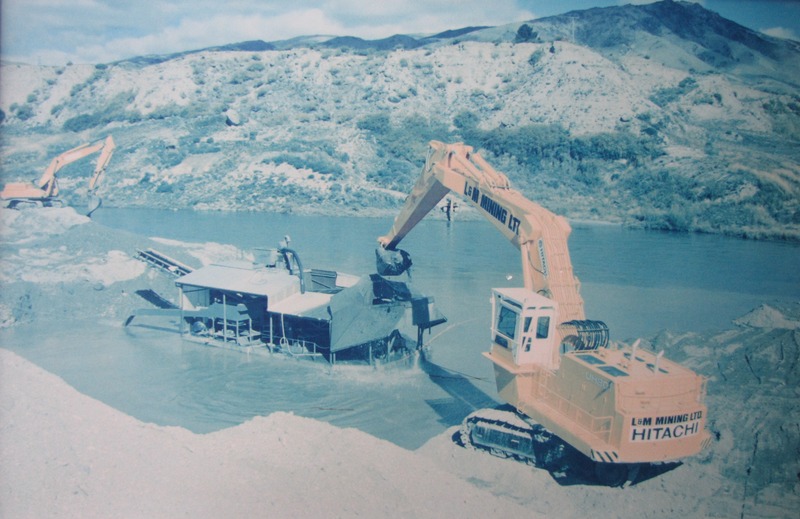 The mining operation required pushing the active river channel hard over to the southern side of the river course and forming a beach for the excavator to safely stand on. The plant worked in a three-sided open pond with the one open side open to the river. Plant throughput was a nominal 80bcm/hr. The area mined was from below the mouth of the Kawarau Gorge to upstream of the Scotland point area. The Kawarau operation recovered ~5000 fine ounces of gold over the 2-2.5 year period worked. This operation mined there from 1987-1989, when the K3 plant was dismantled and relocated to the West Coast, where it mined at Brighton Terrace (1989-1992) and the Mikonui River (1992 -1997). L&M Mining decommissioned the plant following the completion of Mikonui mining around 1997. As of writing (2014), the UH801 is still in existence almost 30 years after its construction. It sat for some years, after the Kawarau project, on an upper, triangular shaped terrace paddock on the north bank of the Kawarau River, just east of the Gorge mouth and south of the main SH6 road, before being relocated to the West Coast where it worked on both the Arahura and Fox Creek operations, for L&M Mining. It was then sold to Doug Hood Ltd., refurbished and used to deepen the tailrace from the newly-constructed second tunnel, at Manapouri in the late 90’s/early 2000’s, before being sold to a Christchurch company for demolition use in Christchurch following the 2010 earthquakes there. When last sighted in 2013/2014, it was located at Queen Elizabeth 2 Park, where it was used in the demolition of the ’74 Commonwealth Games stadium and pool complex. L&M Mining Ltd ceased to exist earlier this year (2014), but its sister company (Mintago Investements Ltd) has been active in alluvial mining in the Central Otago area again since 2009, at its Earnscleugh mine, where it has been mining the upper terraces on the western side of the Clutha River, downstream of the Clyde Dam.